The new suspension bridge is 500m from the cottage this property. It connects the two hiking areas of Ernen and Bellwald and provides access to the national cycle route nr. 1 (of the Rhone glacier lake road to Lake Geneva). Between Ernen and Mühlebach, the bridge provides direct access to the train Matterhorn Gotthard. 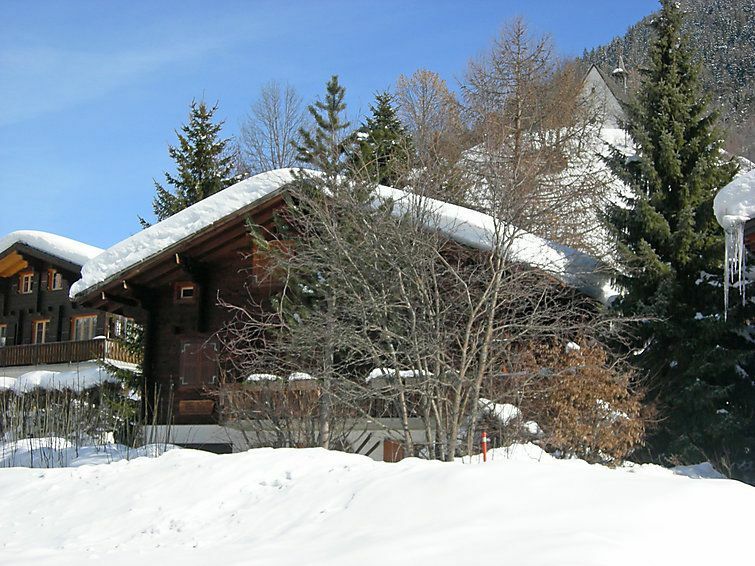 Cosy chalet "this property", 2 storeys. In the hamlet Mühlebach, outside the resort, 1.3 km from the centre of Ernen, in a quiet, sunny position, located by a road. For shared use: garden. In the house: storage room for skis. Parking at the house. Shop 1.3 km, grocery 1.3 km, restaurant 10 m. Ski bus stop 10 m. Please note: ski bus (free of charge). 2-room apartment 40 m2, on the ground floor. Cosy furnishings: living/dining room with Scandinavian wood stove, dining nook and cable TV. Exit to the patio. 1 double bedroom with 2 beds. Open kitchen (3 hot plates, oven). Shower/WC. Patio. Terrace furniture. Very beautiful view of the mountains and the countryside. Facilities: Internet (WiFi, free). Reserved parking at the house. Please note: non-smokers only.